Long before little girls clamored for their parents to buy a pony for Christmas, horses had a long history of being a beloved creature by humans—so much so that they're embedded in myths, legends, and historical accounts. In some of the stories, however, the central animal isn't actually a horse but more of a horse-like creature. Some of the most famous individual horse or horse-like animals include Pegasus and Bucephalus, while groups of horse-like animal animals noted in history include hippogriffs, kelpies, and unicorns. One of the most well-known mythological creatures, Pegasus stars in stories of the Greek gods as an immortal horse with wings and has been memorialized in the stars as a constellation. In mythology, the pure-white Pegasus is said to have sprung from the neck of Medusa upon her death. First tamed by Bellerophon, a Greek mortal hero, with the help of the Goddess Athena, Pegasus was eventually stabled by Zeus after Bellerophon attempted to ride toward Mount Olympus on his winged horse but was thrown to his death. From then on, Pegasus headed Zeus' thunderbolt chariot. As the legend goes, Pegasus supposedly created the spring Hippocrene on Mount Helicon with its hoof struck a rock. Alexander Great taming Bucephalus, 1516-1517, fresco by Giovanni Antonio Bazzi. Perhaps one of the most famous horses that truly existed, Bucephalus belonged to Alexander the Great in ancient Greece. The horse's coat was black and was described as having a large white star on his forehead. It was around 344 BC when a preteen Alexander wagered his father for the horse, claiming he could tame the wild creature. To win, Alexander turned Bucephalus away from the sun, as he had realized that the horse was simply afraid of his own shadow. Bucephalus likely died of old age, though some historians say he was felled by battle wounds. 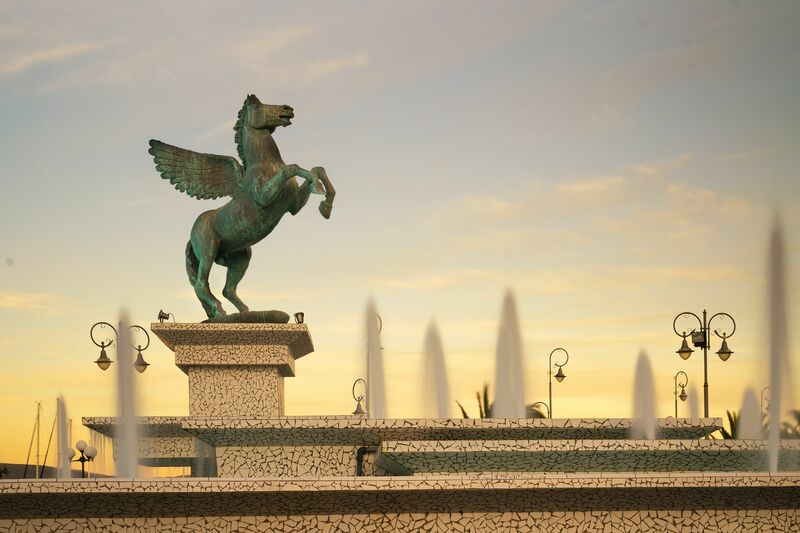 The city Bucephela was founded by Alexander and named after his long-loved equine. Two types of unicorns exist in legend: one from Europe and one from Asia. In modern pop culture, the European unicorn looks just like a pure white horse with a long, slender and spiraled horn on its head, but it was originally more in line with the look of a goat with a short, colorful horn. Reportedly, its horn is pure magic and able to save someone who's been poisoned, but the creature is a rare sight and nearly impossible to capture. In Asian mythology, a unicorn looks like like a horse and more like a deer with reptilian-like scales covering its body. However, it still had that single horn protruding from its forehead. The last person to ever see an Asian unicorn, according to legend, was the Chinese philosopher Confuscious, but its rare appearance would signal a wise and just ruler. In the lore of Scotland, you'll find the shape-shifting water spirit, the kelpie, that most commonly appears in the form of a horse. The most common kelpie story is set in Loch Ness, but kelpie stories surround nearly every large body of water in Scotland. Its first recorded appearance was around 1759 in William Collins' manuscript of an ode. Kelpies aren't necessarily nice creatures, depending on the story you hear, as they have been associated with human sacrifices. However, other accounts give the kelpie credit for keeping kids away from dangerous bodies of water. Kelpies can reportedly transform themselves into creatures other than horses, including male humans. When that occurs, the human typically retains horse hooves, providing a link between the kelpie and the devil. Today, though, the hippogriff is likely more recognizable from J.K. Rowling's uber-popular Harry Potter series in the character "Buckbeak." Viking stele of Odin's horse Sleipnir. In Norse mythology, Odin rode an eight-legged horse named Sleipnir, first accounted for in the 13th century. The steed is referred to as "the best of all horses" and described as gray in color. Icelandic folklore claims that Asbyrgi, a horse-shaped canyon in the northern part of the country, was created by Sleipnir's hoof. Folks can see a statue of the horse in Wednesbury, England. The American legend of Pecos Bill is an amalgam of many tall tales that had their beginnings around campfires of the old west. Pecos Bill owned a horse named Lightning, but was often referred to as "Widow-Maker." The horse was so named because he could be ridden by no one else but Pecos Bill himself and he disliked Bill's bride that he bucked her off, resulting in the end of the couple's relationship. Widow-Maker apparently adored eating dynamite, but Pecos Bill sometimes rode a mountain lion rather than Lightning as a point of his toughness. How Long Will My Horse Live?